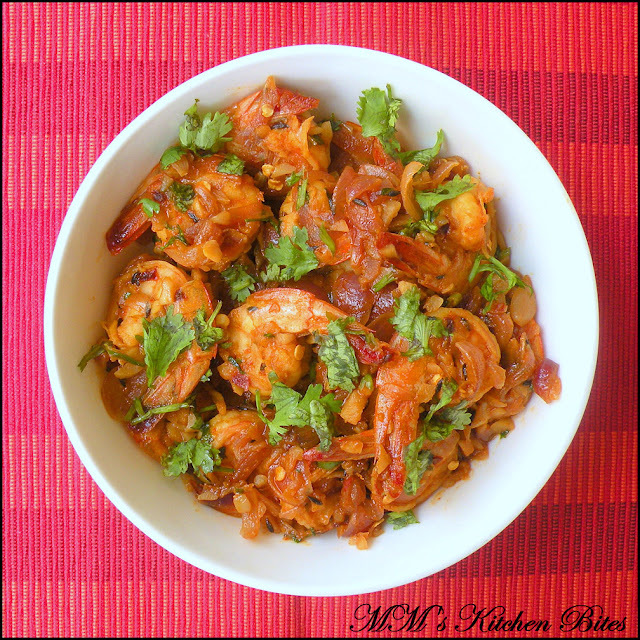 MM's Kitchen Bites: Prawn Masala...doesn't need a tag line!!! Mix all the ingredients mentioned under marinade. Add in the cleaned prawns, mix well and keep aside for half an hour. Heat oil in a pan/wok/kadhai. Add in the cumin seeds. Add the onions/shallots and sugar (if using) once the cumin seeds start spluttering and fry till the onions turn soft. Add in the tomato puree. Let it cook for a couple of minutes. Add the prawns with the marinade. Sauté for 4-5 minutes till prawns are cooked through. Check for seasoning and serve hot garnished with coriander leaves. You can skip using tomato puree, if you want – just sauté the onions till they nicely caramelised and golden brown. Add in the prawns and cook till done.